A while ago Princeton University Professor and Field Medal winner Dr. Manjul Bhargava gave an enthralling lecture at the Madras Music Academy on the relation between mathematics and music. This presentation revolved around the rhythms of ancient Indian poetry, music and the math behind them as expounded in various treatises such as the Nātyashāstra and the Sangeetha Ratnakara. He explained how even fundamental concepts in math could be understood in terms of poetry and rhythm thus demonstrating that the subtle yet vital connection between the poetry, the performing arts and mathematics. What are the possible ways you could fill up 8 beats with a combination of short (1 beat) and long syllables (2 beats)? …. till we get to n=8 and so on. As you can see, as the value of n continues to increase, there are more and more combinations. To avoid writing every combination out, could one get the total number of possible combinations for any value of “n” in a generalized manner? In 300 BCE the scholar Pingala, in his work on prosody, came up with the algorithm to solve this problem. According to Dr. Bhargava, Pingala’s formula was to write down the numbers 1 and 2. Then, each subsequent number that is written down must be the sum of whatever two numbers precede it. Finally, the nth number you write down will be the number of possible rhythms having n beats. If one does this, one will get the following sequence of numbers:1 2 3 5 8 13 21 34 55, etc. Going back to our question of how many combinations are possible within a range of eight beats, Dr. Bhargava pointed out that the total number of possible combinations are 34, which is the eighth term in the aforementioned sequence. These special numbers, as discussed by Pingala are known as the Hemachandra numbers or more popularly known as the Fibonacci numbers. Dr. Bhargava lamented the fact that most Indians are unaware that Fibonacci merely rediscovered this sequence over a thousand years after Pingala’s original work. We can now further this question of how to find the total number of rhythms having n syllables by adding more specificity. To add this specificity, one can lay down the condition that there has to be a certain number of long and short syllables within the given framework of how many ever beats there are. Pingala’s method to do accommodate this added specificity is as follows. Write down the number “1”. Then for each number below it, add whatever two numbers that are diagonally above it. For example, the second row from the top is “1 1” because both are the result of the sum of 0 and 1 (zero’s existence is implied to the left and right of the initial “1”). Another example is if we are to take the number 3, the 2 numbers diagonally above it are 2 and 1 – 2+1 = 3. If we continue to do this, row by row, we get the following mathematical construct, known as Pingala’s Meruprastara or Pascal’s triangle (below). These binomial coefficients play an extremely important role in combinatorics, number theory and other areas of mathematics. To obtain the number of combinations, we must go to the row which is the same number as the number of beats in your rhythm. If we have n laghus specified in our beat, then we move over to the nth term of the row, and that term is how many possible rhythms exist. This example serves brilliantly as an illustration of the fact that music and math have overlap each other more than one would think. Dr. Bhargava explained how Indian musicians use this effortlessly to perform rhythmic patterns on stage. Dr. Bhargava then went on to talk about meters in ancient Indian poetry. He commenced this discussion by introducing the audience to what he calls the nonsense word. This word, “यमाताराजभानसलगा” (yamātārājabhānasalagā) has a great significance in Indian prosody. A little background on chandas (prosody) is useful before we jump into Dr. Bhargava’s exposition. In English poetics, every syllable is one of two kinds – either “stressed” or “unstressed”. These combine to form five basic meters, namely iambic, trochaic, dactylic, anapestic and spondaic. The exact intent of the words unstressed and stressed is shrouded in ambiguity but in general, they have to do with the emphasis given to a syllable. I find that one’s accent is often one of the defining factors behind which syllables sound ‘stressed’ or ‘unstressed’ to us, leading to much ambiguity. The second of these special scenarios is when a syllable is followed by plain consonant or a conjunct consonant. A plain consonant is a consonant that is not immediately followed by a vowel. If we have the words राम (rāma) and राम् (rām), the म् (m) at the end of the latter is a plain consonant. A conjunct consonant is a letter formed from the joining of two other consonants. Any letter in a word that is followed by a conjunct consonant is labelled as a guru. Thus, unlike western poetics, these classifications in chandas take into account the length/duration of the syllable rather than mere verbal emphasis. This concept of ‘time duration’ as opposed ‘emphasis’ is the basis for music, prosody, patterns and rhythm in the Indian system. Dr. Bhargava’ work focuses on these fundamentals of chandas and looks at numerous mathematical frameworks that arise out of this structure of prosody. With this introduction to Indian poetics, let me explain to you the significance of this seemingly meaningless cluster of syllables, “yamātārājabhānasalagā” that we mentioned earlier. It is essentially an extensive encoding device used to remember “gaṇas” or sets of three syllables, the basic unit of poetic meter. According to this word yamātārājabhānasalagā (the monosyllable “ya” stands for its corresponding triplet “ya-mā-tā” which poetic terms stands for a laghu-guru-guru sequence. In the same manner, mA stands for “mā-tā-rā” or guru-guru-guru and so on. Thus we can describe a meter which consists of a laghu-guru-guru and guru-guru-guru pattern with the word “yamā.” Thus, this allows for the condensation of long rhythms by a factor of three and thus, a 12 syllable phrase can be converted into a 4 syllable phrase. Dr. Bhargava went on to say that if one were to write out “yamātārājabhānasalagā” in binary, where 0 stood for a short syllable or laghu and 1 stood for a long syllable or guru, this word will translate into the following sequence: 0111010001. Now, if one takes each consecutive triple (consisting of combinations of 0s and 1s), one will find that all possible triples made of 1’s and 0’s are exhausted. For e.g. The first triple is 011, the next triple is 111 and the third is 110, i.e., each triple is derived with every number in the sequence acting as a starting number at some point (as supposed to every third number). Let us assume that we have a rhythm that is encoded in the word rāma. We have 2 syllables, rā and mā. According to yamātārājabhānasalagā, rā stands for rā-ja-bhā (101) and ma stands for mā-tā-rā (111). Thus the 2 syllable phrase rāma translates into the six syllable phrase 101 111. This a short and easy way an artist can, for instance, communicate with his fellow percussionist, by merely reciting a short verse. This verse will in turn translate to a rhythmic pattern with three times the amount of syllables. If your rhythm happens to not be a multiple of three, how would you go about representing it? Such a rhythm will have either 1 or 2 extra syllables. To accommodate these extra syllables be it 1 or 2, this nonsense word provides us with a solution. The la and gā at the end of yamātārājabhānasalagā stand for 1 syllable and 2 syllables respectively (la stands for laghu and ga for guru). Thus we can write down the sequence normally and substitute la or ga to accommodate the extraneous syllables. This describes the meter known as the Bhujangaprayātam or the “gait of the cobra.” This verse, which itself is composed in Bhujangaprayātam, defines this meter as “chaturbhiryakāraiḥ” or one that consists of four “ya” letters. According to yamātārājabhānasalagā, four ya letters translate into binary as 011 011 011 011. Therefore, one cycle of the meter Bhujangaprayātam is made up of a “laghu-guru-guru” phrase repeated four times. This is a wonderful example of the coding and condensing mechanisms embedded within ancient works of literature to ensure they are transmitted from generation to generation with ease. Dr. Bhargava concluded his lecture by lamenting the state of affairs regarding education in India, pointing out the fact that most Indian students do not learn the history of these math concepts in schools. He thinks learning math through Indian music and Sanskrit poetry offers a new and fresh perspective. He hopes that many others would get inspired as they see the magic in mathematics, music and Sanskrit prosody as they begin to connect the dots across various fields without boundaries. I for one left the hall feeling amazed by Dr. Bhargava’s talk, for he had articulated in coherent language and provided a framework for what I intuitively knew about music, mathematics and Sanskrit. A visarga in Sanskrit is defined “as an allophone of /r/ and /s/ in pausa (at the end of an utterance). Since /-s/ is a common inflectional suffix (of nominative singular, second person singular, etc. 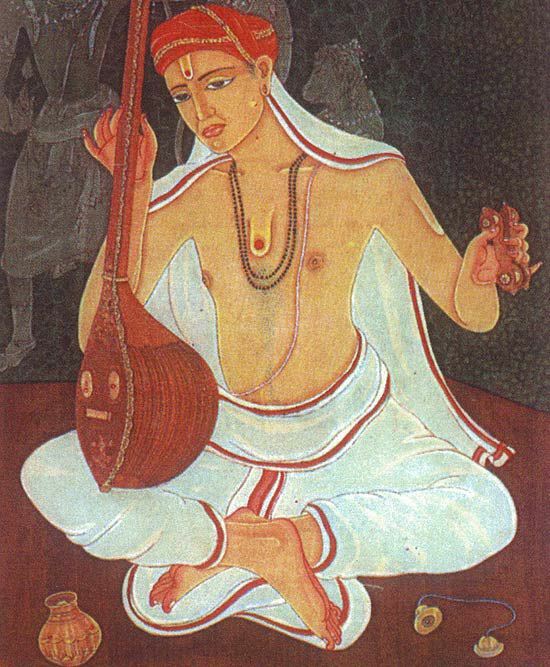 ), visarga appears frequently in Sanskrit texts. In the traditional order of Sanskrit sounds, visarga and anusvāra appear between vowels and stop consonants. – “Visarga.” Wikipedia. Wikimedia Foundation, 04 Apr. 2017. An anusvara is defined as “the diacritic used to mark a type of nasal sound used in a number of Indic scripts. Depending on the location of the anusvara in the word and the language in which it is used, its exact pronunciation can vary greatly. – Anusvara.” Wikipedia. Wikimedia Foundation, 05 Apr. 2017.